There’s a famous, oft-quoted quip in Alberta: “You came to Banff for a rest and a change. The CPR provided the rest and the Brewsters took the change.”In Southwest Alberta, you cannot fail to notice the name Brewster: on buses, hotels, stables, sleigh rides, a backcountry lodge, an outfitter’s, a golf course, a dance barn and a guest ranch. Brewsters have been connected to the growth of Alberta for over 130 years. 1886 - Year that dairyman John Brewster moved to Alberta from Ontario and established a homestead below Yamnuska Mountain — today’s Kananaskis Guest Ranch, about 50 km (30 mi) from Banff town. Two of his pre-teen sons, Jim and Bill, began guiding guests to fishing spots in recently created Banff National Park, through their friendship with Stoney trapper William Twin. Within a few years, they had their own guiding and outfitting business in Laggan (now Lake Louise) and Field, BC, and a trading store in Banff. In 1905, the CPR sold its livery service to them and awarded them the contract to transport hotel guests between the train station and the Banff Springs Hotel. With tourism prospects firmly in his sights, Jim and Bill bought the Mount Royal Hotel in Banff. The two brothers married two sisters. Bill and Sylvia (called Missy) had one daughter, Sydney and two sons, Claude and Jack. Jim and Lade (called Tessa) had a daughter, Fern. 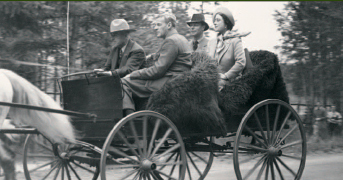 70 - Number of horse-drawn sightseeing carriages that Jim and bill Brewster replaced with five overland vehicles by 1916. Tourism suffered during the First World War, however, and Jim began to battle personal demons, handing over day-to-day management to Bill, called “The Boss.” Bill’s great-granddaughter Cori Brewster explains, “Jim was very outgoing and shown in the limelight, but Bill was equally important in Brewster Transport.” It prospered and expanded during the 1920s, building up a 79-vehicle fleet of touring cars and buses. The family enjoyed guest ranching and moved to the Kananaskis homestead, where Missy built the main lodge in 1922. In 1928, the Alberta government gave Brewster Transport the go-ahead to run bus service between Calgary, Banff and Edmonton. After the 1930s Depression saw a downturn in company fortunes, Bill (d. 1971) resigned to open a Ford dealership. That building is now part of the family-run Brewster’s Mountain Lodge in Banff. The only one available was so rickety that Her Majesty asked, “Brewster, do you think this wheel’s going to come off?” Jim assured her, “No, Ma’am, this buggy’s good for a thousand miles.” The Queen replied, “I’m afraid we won’t be with you quite that far.” Then Jim took them home to meet his startled wife, Dell (his second marriage) and to view his hunting trophies. In the 1930s, Jim (d. 1947) built a lodge at Sunshine Village ski area and an inn at the Columbia Icefield. Bill’s wife Missy and their son Claude managed the ranch and backcountry operations through the lean 1930s and ’40s. Claude, his wife Ruth and their sons Jack and Bud took over until Claude and Ruth retired in the 1950s. Because Claude had grown up with the Stoney Indians at Seebe, he was able to promote the Trans-Canada Highway through the reserve, and helped bring the Banff Gondola into the national park through his political connections. 6 Movies involving Bud Brewster, fourth generation entrepreneur, as outfitter for mid-century movies filmed in the Rockies. During Son of Lassie (1945), it took Bud four days to pack in all the props on horseback in pre-helicopter days. One odd prop was a dead dog “for any dangerous shots,” he recalled in a later interview. In a shoot for River of No Return (1954) with Marilyn Monroe and Robert Mitchum at Kananaskis Guest Ranch, George Brewster’s son Jim doubled for Mitchum. Bud persuaded the local power company to lower the water level in the river for a dangerous sequence running the rapids. To Bud’s disappointment, Parks Canada eventually disallowed the use of Banff National Park as a film set. After years of tourism closures that started in WW2, Brewster Transport sold to its main competitor Greyhound in 1965. Bud and his wife Annette, with their daughters Janet, Cori and Alison, modernized the Kananaskis Guest Ranch while operating Brewster Mountain Pack Trains (the family’s outfitting company), and Brewster Lake Louise Stables. 5 generations of Brewsters that have shaped the continuing business dynasty and helped build the province through wars, competition and challenges such as strict government guidelines for park use.